This is a britchin' holding a riding saddle in place on my neighbor Patti's mule. I’ve noticed from the “stats” provided by WordPress, that some people have been coming to my site looking for basic information about burros and pack-saddles and other burro gear. I would like to provide answers to these types of questions, so if you have any just ask them in the comments and I will answer them based on my experience. For the person googling the difference between a donkey and a burro, there is none. The word “burro” is Spanish for donkey. Out West we almost always refer to these animals as burros. Of course, a cross between a donkey/burro and a horse would be a mule. Quite often people will refer to my larger donks as mules, and I’ve given up on correcting them. As far as gear goes, when I first got into pack-burro racing back in 1980, one of the first things I realized I needed to buy was a pack-saddle. I bought a Colorado Saddlery Burro Pack Saddle for $175 in 1981, and it is the same one I’ve used in countless races over 27 years. I’ve also used it on a lot of training runs and pack trips on animals of various sizes. All the leather is still original and in good shape, and I don’t think a person can go wrong with one of these saddles for basic packing or pack-burro racing. One problem in saddling donkeys/burros and mules is that these animals generally have a less pronounced withers than a horse, and thus the saddle tends to slide forward, especially on a downhill. Pack saddles usually come with a “britchin’ ” (breeching) which is the rigging used to keep the saddle from sliding forward. 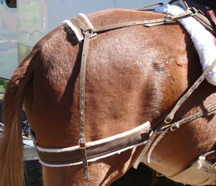 While this style of rigging is the only way to go when packing a heavy load, many pack-burro racers instead use a crupper, which runs under the tail to keep the saddle from sliding forward. While a crupper allows more freedom of movement in the rear end, and eliminates the chaffing that can be caused by a britchin’, some say it can put undue pressure under the tail at a point where a lot of nerve endings come together. I’ve run a number of tests using both a crupper and a britchin’ and I’ve decided a britchin’ is the only way to go for packing heavy loads, and also on a riding saddle. However, in pack-burro racing, where the animal must trot for very long distances and the burro is only carrying 33 pounds, it’s nearly impossible to get a britchin’ rigged exactly right so it doesn’t chaff the rear flanks. I’ve gone back to the crupper for training and racing, and have not noticed any ill effects. It is important that the crupper not be adjusted too tightly, and that it be made of good quality leather. The better ones contain flaxseed as a stuffing. This entry was posted on September 2, 2008 at 10:58 pm and is filed under Burros. You can follow any responses to this entry through the RSS 2.0 feed. You can leave a response, or trackback from your own site. Nice website for donkeys and such! I have always held you pack burro racers in high esteem, as I’d rather ride then run beside the donkey!! I enjoy watching your races, and enjoyed visiting this site for donkey info.